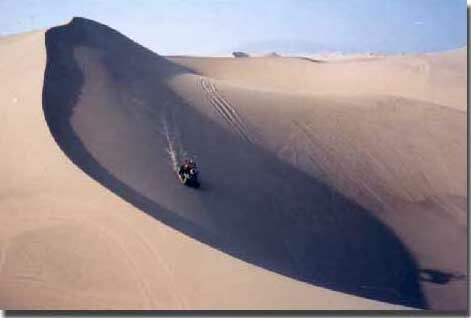 The St. Anthony Dunes are about eleven miles from the town of St. Anthony in eastern Idaho. 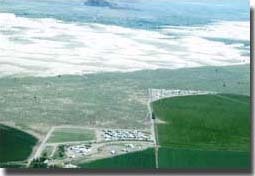 Golden-white quartz sand covers an old basalt lava field in a strip about a mile wide and thirty miles long. The dunes range in height from ten feet to over 400 feet, but they never look the same. The wind that blew the sand to this place continues to rearrange it. The dunes continue to shift, moving about eight feet a year toward the east. Geologists now know that the wind blew the sand to this place many thousands of years ago when Idaho's ancient Mud Lake, about forty miles to the west, began to dry up. As water receded from the shoreline, the wind picked up the exposed sand and carried it off.